Exceptional car, one of 152 pieces made. Finished in Giallo fly over Nero hide interior. All aluminum bodywork, accident free and matching numbers, older paintwork with fully original interior, the mechanics were however totally rebuilt to the highest standards. Barely driven since, the car is fully sorted throughout and comes with original books / papers. 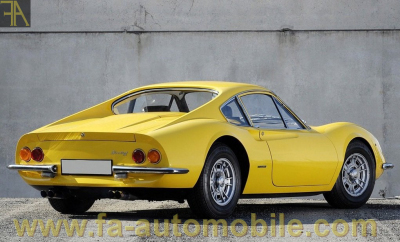 Rare opportunity to acquire the most sought after Dino ever made. Please contact us for further details and photos.